This LEGO® BrickHeadz™ 41615 Harry Potter™ & Hedwig™ play set is fun to build using colorful LEGO bricks that recreate all their iconic details, including the young wizard’s signature round spectacles, lightning scar, Gryffindor™ scarf and black cape with the Gryffindor emblem. The Harry Potter BrickHeadz figure also has a detachable wand and stands on a buildable collector's baseplate for easy display in your home, office or anywhere you like. The Harry Potter™ & Hedwig™ (41615) Lego set is no longer directly available from the sites below. However, 3rd party partners of these sites might still have the set available. 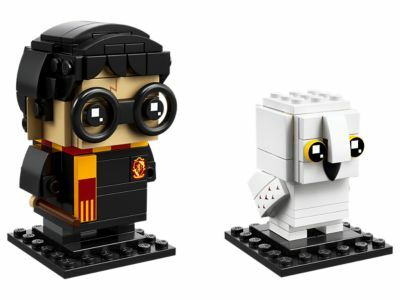 Alternate description Conjure up some magic with LEGO® BrickHeadz™ Harry Potter™ & Hedwig™! Buildable Harry Potter™ and Hedwig™ LEGO® BrickHeadz™ construction characters feature decorated eyes and authentic details from the original blockbuster movie Harry Potter and The Sorcerer’s Stone, including Harry’s round black spectacles and a magic wand. LEGO® BrickHeadz™ Harry Potter™ comes with his own buildable collector's baseplate. Have fun growing your LEGO® BrickHeadz™ collection with other characters from the original blockbuster movie Harry Potter and The Sorcerer's Stone, plus many more from your favorite films, TV series, games and comics. Mash up your LEGO® BrickHeadz™ construction characters to create supercool hybrids or your own amazing characters. Young Harry Potter™ stands over 2” (7cm) tall without baseplate.